A new kind of Bond movie, inspired by The Bourne series, that is dark and gritty and also very smart. 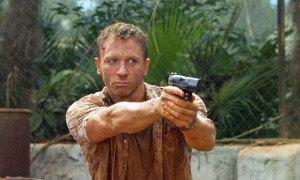 Casino Royale is the movie that relaunched the Bond series and took it from a campy, silly, stunt-filled picture to a gritty, tough, and realistic action movie. It suddenly got darker and dirtier and was clearly influenced by the success of the Bourne movies. People appreciated those movies because they weren’t pretty and cartoonish, but were honest, and often unhappy instead. Bourne was a flawed hero, and that’s exactly what this new Bond, played by Daniel Craig, in Casino Royale, became. The film was also influenced by Batman Begins, and how Christopher Nolan took what had become a very campy Batman franchise in the hands of Joel Schumacher and relaunched it as darker and more psychological. Like that movie, Casino Royale, reintroduces the Bond series from the very beginning, giving us a sort of origin story. It’s also the story of how and why he became so detached from the world and so unemotional. 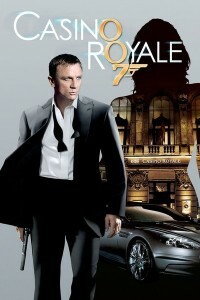 The movie opens up with Bond’s first killings that make him into a double 0 agent for the British intelligence. It’s all done in black and white. everything leading up to the credits. And then suddenly we’re in color for a terrific song and credit sequence that pops off the screen with computer graphic imagery that combines the art of killing with the gambling of casinos. Following the credit sequence, we’re at the true start of the movie. There’s a fantastic chase scene at a construction site in Africa that has the villain jumping around like a monkey, faster and more agile than anything Jackie Chan’s ever put on screen. This actor, playing the villain, is the cofounder of the sport Parkour, which is all about jumping from place to place, and he really demonstrates that here. When we get into the heart of the story, Bond is tracing clues, first from a bomb maker to the bomb, and then to the guy who orchestrated the bombing. It’s a mystery filled with great and elaborate action, and it holds nothing back. There’s humor here, to be certain, but it’s not about campy short-lived one liners like the old Bonds used to be. 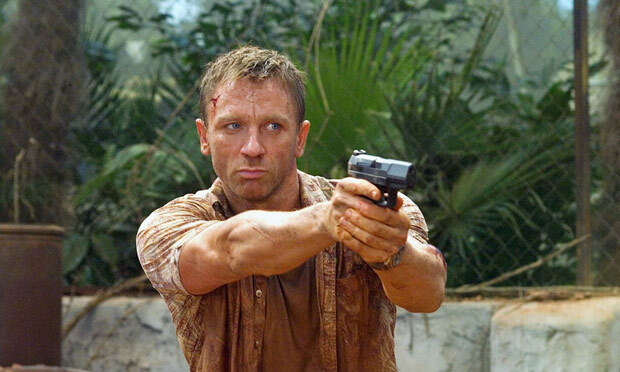 This Daniel Craig Bond is serious business. He’s after a guy named Le Chife, who takes the money from warlords, promises to put it into a safe bank account for them, and then uses it himself to finance his own investments. This man ends up playing Bond in the Texas Hold Em Poker Tournament at Casino Royale in Monte Carlo. But long before that we’ve followed Bond from Africa to the Caribbean to an airport chase and explosion that caps off the first half of the movie. At the end of this first half, one thing is certain…Le Chife, a man who cries blood from a problem with his tear ducts, is our villain, and now it’s time to go after him. That brings us to Monte Carlo for a terrific night of Poker. The actual poker games in this movie are a little extreme (nobody really gets hands as good as these), but what I do love about it, is that the poker tournament is an all night event. That includes taking about an hour break, where the characters go off and do their own thing around the hotel, before returning to the table. And after all of the poker and villains associated with it are taken care of, the movie still has a whole new twist that launches us into a different and unexpected final act. This takes us to Venice where the story gets wildly dark and emotional. It’s the perfect time for such a move, really raising the ante on the importance of what’s happening. This isn’t just another Bond movie, like the others…this is the single Bond movie that alters the character’s life in ways that are detrimental and absolutely unforgettable. Casino Royale does everything it sets out to do and then some. It really does take Bond from place to place, allowing him to follow clues, more like a detective than a secret agent. It’s dark and edgy and it’s as elaborate as any Bond movie there ever was. This is the Bond for a new generation and Daniel Craig nails it, giving us exactly what we need. Martin Campbell, the man who introduced Pierce Brosnan as Bond in Golden Eye, directs this movie as well. He’s a pretty remarkable director, constantly wanting to rework material he’s already done in a different way to see if he can improve it (he directed the British film Edge of Darkness in the 80s and then last year directed the American remake of the very same film). Campbell knows exactly how to make this movie and he doesn’t miss a single beat.